You may have to reach a little. 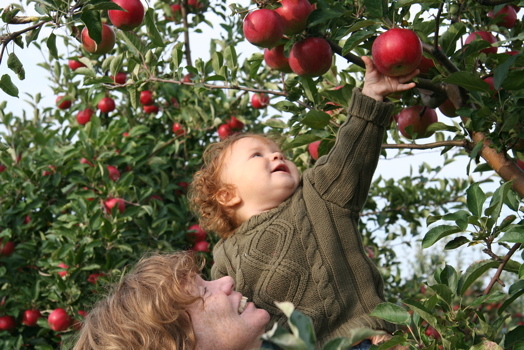 2011 Update: We've put together a much more extensive listing and map of pick-your-own apple orchards in the Capital Region. Apples are here!!! McIntosh and all your other favs. If picking your own is your thing, here's where to go. Can't wait to apple picking!! One of my favorite things about this time of the year. I'm all for Goold's, but people are trying to sway me to go to Beaumont Orchards (sp?) this year ... Suggestions? I have to say, I am super excited about going to Goold's this year! Sharon Orchards in Sharon Springs off of Rt 20. Schilde's in Sharon Springs (heading toward Canajoharie) Rt 145. Boeringer's in Middleburgh Rt 30. Cobleskill has a great farmer's market "downtown" at Main and Union on Saturday mornings. Also the former Carrot Barn in Schoharie, Main St. Thank you AOA for this awesome list! Anyone know where/when I can pick Gala apples. They're the only ones I really like but I've never arrived when they are the ones being picked.